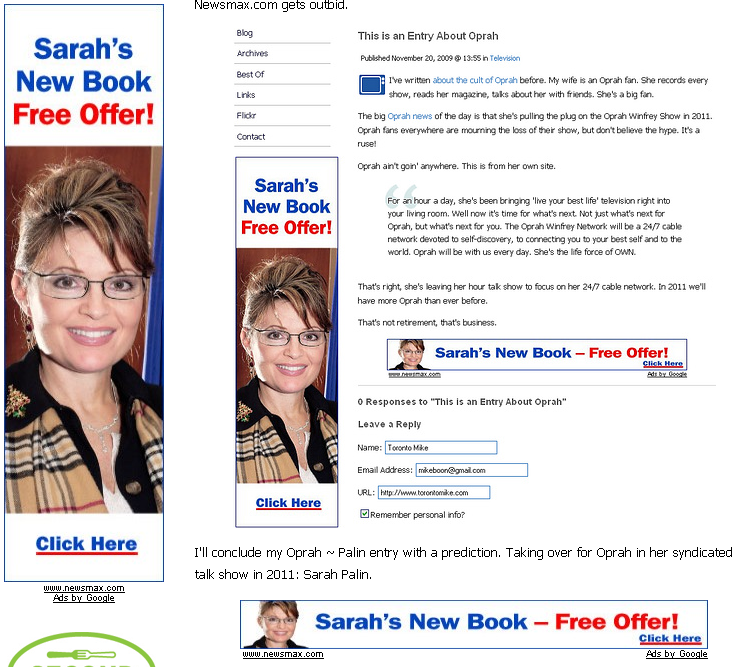 The entry I just wrote about Oprah triggered an onslaught of ads for Sarah Palin's new book. I'm guessing the company behind the ads, Newsmax.com, is bidding heavily on the popular keyword "Oprah", perhaps in conjunction with the keyword "magazine", realizing those in the Oprah cult are most likely to spend $4.97 on Palin's book, "Going Rogue". 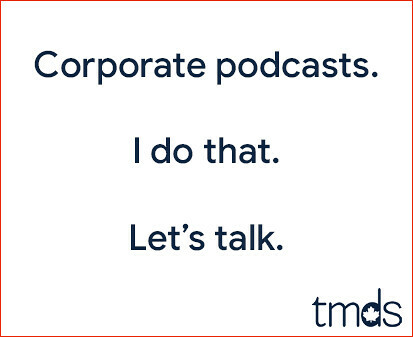 As many of you have remarked, the ads are pretty creepy. I took a screen cap of them in case Newsmax.com gets outbid. I'll conclude my Oprah ~ Palin entry with a prediction. Taking over for Oprah in her syndicated talk show in 2011: Sarah Palin. 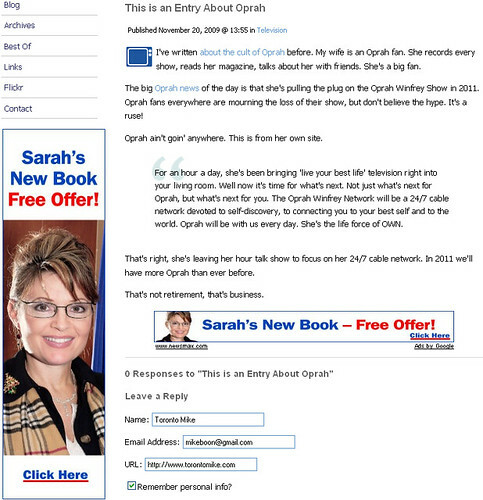 Now the entry about the Palin ads has Palin ads. I would assume they just bought the keyword phrase "don't believe the hype". Did you happen to use the phrase "vapid moron" in the metadata? It puts the "sales figures" of "her" new "book" in some perspective, though, if the extremists at Newsmax are buying them all up to sell cheap to rubes at their site. Palin's just another recipient of wingnut welfare, like Coulter, Malkin, Beck, Goldberg, and on and on. Palin was just on Oprah - it was a big deal in the Oprahsphere.